With over 60 years of experience, Flender Graffenstaden is a leading manufacturer of high efficiency gear units: speed reducers and increasers, auxiliary and special gearboxes. They are used in all processes in power plants, refineries, offshore and onshore oil and gas installations. 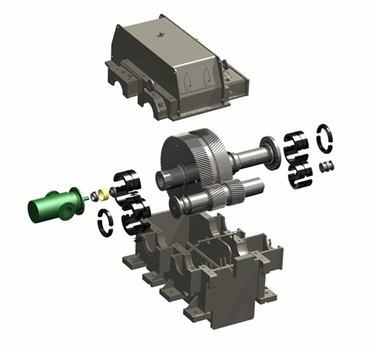 Flender Graffenstaden manufactures load and auxiliary gear units used on some of the most common designs of gas turbines for starting and driving the auxiliary equipment such as compressors, oil pump and to transmit thee torque to the generator. Flender Graffenstaden supports the gearbox owners by providing original spare parts: gearset, bearing, oil seal, accessories and instrumentation. Most of the spare parts are tailor made. Flender Graffenstaden genuine parts can guarantee a full interchangeability, trouble free operation, cost effectiveness and high efficiency in power plants. Flender Graffenstaden authorized field service team can provide the correct solution to ensure high reliability, high operational safety and reactivity and flexibility. The field service team can go to site to assist on preventive maintenance, spare parts policy, inventory of spare parts, alignment verification, vibration and noise analysis, oil flow and efficiency documentation by OEM factory trained gear people. Flender Graffenstaden is active in the revamp market to upgrade the older version of gearboxes. The aim is to provide life cycle extension, increase power rating, and improve efficiency and power consumption.